The Distributor with Atop Gravity Discharges. This patented design ensures a uniform flow at each outlet. Vishwakarma Brand Compost Spreader Machine Is Specially Designed For The Scattering Of Compost Dumps On The Ground. This Machine Is Scattering Compost Uniformly In All Directions. This Machine Save The Time And Fuel. 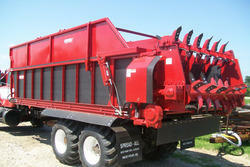 - Suitable For Large Scale Compost Spreading. We are leading Wholesale Distributor and Trader of Agricultural Tractors Manure Spreaders. Spreader Is A Best Dispersive Media Which Can Be Used In Every Spray Of Insecticides, Pesticides, Fungicides, Weedicide. Spreader Improves Dispersing And Spreading Quality Of The Spray Solution. 50-100 Ml. Spreader In 200 Litre Of Water. Mahindra Fertilizer Broadcaster (Spreader) one time capacity of tank is 400 lt (8 bag) & mini gear box operate with Tractor PTO power, easy to move with four tyers. - Tool comprises 1 Double action cylinder. • With Ergonomically shaped control handle with integrated safety device and piloting. • Automatically locking anti-pollution HP quick action couplers fitted with metal protection plugs. Imasia Cad Cam Services Pvt. Ltd.
SweFrame Port Equipment has designed the Mobile Harbour Spreader to serve the high demands on robustness and versatility required of its application. 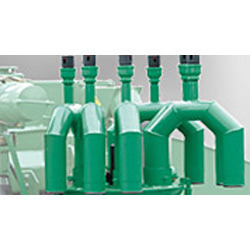 It is designed to handle containers sized from 20 to 45 feet with ISO twistlocks. We are providing interior & exterior products like wallenstein. Mahindra Fertilizer Spreader has been specially designed for spreading fertilizers in the field. This technology has been introduced for the first time in India. This machine is a three point linkage mounted implement and can be transported from one place to other.